MARQUETTE — Chances are you’ve seen Marquette native Phil Nemisto sauntering down the streets of downtown Marquette, cleaning windows, tending to flower beds and engaging the locals with one of his many stories. And now he’s being honored for his many years of hard work for the community. 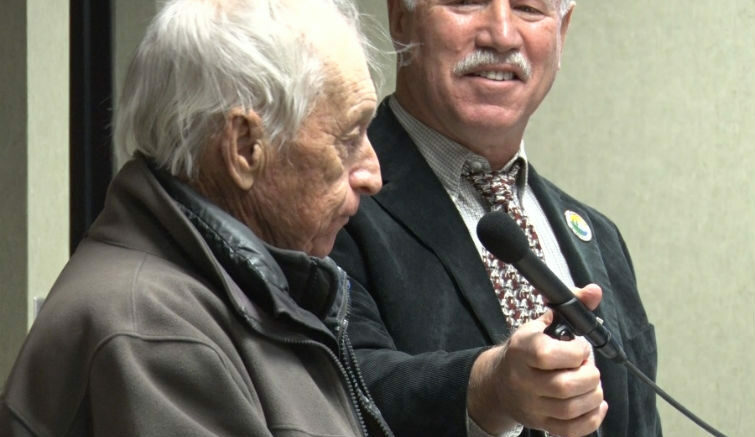 The Marquette City Council unanimously approved to rename the pocket park on the 100 block of Washington Street in Phil’s honor at their meeting Monday night. Mona Lang of the Downtown Development Authority pitched the idea to the council because she thought it would pay a nice tribute to the many years of hard work Phil has dedicated to its upkeep. Mayor Dave Campana said the council overwhelmingly supported this notion. Phil received a plaque commemorating the grassy area as the ‘Phil Nemisto Pocket Park’ at the meeting. He said even if he hadn’t received this honor, he would still continue tending to the garden.